Which potentiometers should I buy? "Which potentiometers should I buy?" "Use a potentiometer with a resistance in between 10kOhm and 100kOhm. Linear taper." My question is: What's the effect of using a 10kOhm potentiometer rather than a 100kOhm potentiometer or vice versa? Also, I am considering using push button rotary encoders, so as to double each potentiometers' functionality. Is this advisable or are there drawbacks to this idea? I look forward to hearing your experiences. Thanks for the replies, Lokki and timeorspace. I think I will get 10k's rather than the 1's or 5's mentioned in the arduino conversation. Maybe get 100's as well just to see if there's a noticeable difference. Still, those push button potentiometers look appealing as well. Has anyone used them with axoloti before? The potentiometer restistance is more about as lokki states current draw and load. If you realy want to consider your original question "Which potentiometers should I buy?" hen the best answer for this has very little to do with resistance as long as it is an appropriate resistance range, but more about the brand of pot, and the materials used to make it. I seen in guitar world this is a debate that is regularily raised. It this goes both for linea and log pots which aren't as much like log pots as you might think, and once again different manufacturers do this differently. Regarding rotary encoders, not quite sure how you double a pots functionality by using this, but if you are trying to use a single pot to control many parameters, every time you change to a new parameter, the pots current possition value gets applied automaticaly, and the previous parameters value will be lost unless you set it up to hold the last used value. But a rotary encoder can change for parameter to parameter and values can be adjusted easier, but you loose the expression feel you get from a pot. I guess the best answer is to use a pot where you want expression, use a rotary encoder for easy adjusting values. But Regarding rotary encoders, not quite sure how you double a pots functionality by using this, but if you are trying to use a single pot to control many parameters, every time you change to a new parameter, the pots current possition value gets applied automaticaly, and the previous parameters value will be lost unless you set it up to hold the last used value. But a rotary encoder can change for parameter to parameter and values can be adjusted easier, but you loose the expression feel you get from a pot. Good point, I am sticking with pots! On the subject of holding a pot's position, I was going to try and implement a save/load preset function. And perhaps use a rotary encoder for cycling through the presets. Ah thank you for pointing that out. So then I guess not all encoders rotate endlessly - My Microgranny has preset save/load, but its knobs don't rotate endlessly. They're not the most expressive knobs but I guess it's a good trade off if it allows preset saving. I guess you could sample the position of a pot and then store that as part of a preset, but if you then want to control that parameter with a pot you would have to have a motorised pot to be able to set it back to the same value. Motorised pots are not cheap and also need some sort of feedback mechanism to ensure the value set is the desired value. Motorized pots are definitely not an option at the moment. This is going to be my first build. I think I will go for encoders, as the preset saving option is important to me. On the bright side, this does reopen the option to use push button encoders and double each encoders function. I just had a look, and actually the MG does have pots. When you return to control parameter A after having switched to B using the same pot, the knob position for A is out of sync. You need to turn the knob until you hit its original position, which is indicated by a small LED lighting up the moment you hit the spot. Works well, and yeah, the MG's pots are more sturdy and expressive than I recalled. It wouldn't be too hard to impliment somewthing similar on the Axo. If preset value is less / greater then pot value, value is equal to preset value until pot value is equal too or less / greater then preset value. Something like that should do the trick. The higher the resistance the lower the current draw. So in the best case a 10k pot draws 0.3 mA while a 100k pot draws 0.03. If you want to go for low power that makes some difference, but compared to the CPU, the audio codec and the power amp on the axoloti it doesnt add that much to the total power consumption. Apart from the current draw, What are the main (audible) differences between high or low resistance pots when using them? So here is my first design. It's a noob's fantasy design based on the fabulous Xylobox by @matthewcieplak (http://community.axoloti.com/t/the-xylobox-wavetable-synthesizer-hardware-patches/1353). Just because it's great and there is a lot of information on the build available. In my sketch I added no less than 27 tiny buttons, a rotary encoder, and 48 leds to the original design. The idea being that eventually I can create my own original patches and turn this box into just about anything. It's probably insane for me to try and build this - if it's even possible, and I reckon I will be on here a lot, asking questions :). I really hope there are some of you out there who are happy to help me with much needed advice and knowledge. I have a great helper - my dad, who has some electronics building experience. However his last projects date back about 40 years or so. I look forward to hearing your thoughts on my fantasy design and whether or not it is possible at all to add this many extra buttons and leds. Because that's my first question: what would be the best way to approach adding the extra buttons and leds ? Sounds like its going to be quite a journey. With all the pots, leds, switches, LCD display and of course the rotary encoder, is to think how all this will interact with the Axo. I expect with a lot of extra IC's etc, it could all be connected to the Axo directly, but this could take up precious resources from the Axo. So then the next thing to consider is maybe using other micro controllers to assist, Arduino, teensy etc.. This way you will have access to more GPIO's to connect all your Pots, Switches, Led's etc to. 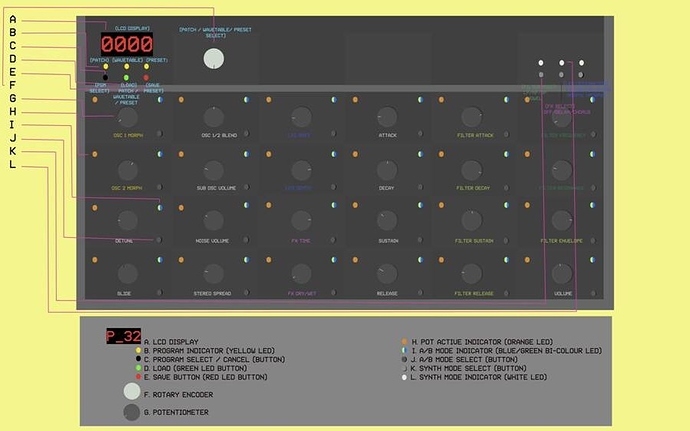 Then how will this all communicate with the Axo, for example you may want to use midi, even if it is all built internally, you can still connect them together using midi. Just some things to think about.. If you attach a pot to a microcontroller, in this case the Axoloti, you're making an adjustable voltage divider between VDD and GND, so if the pot has the same rotation angle, the value should always be similar for the same angle. The resistance doesn't matter, but the ratio between the two resistors you're building (one from VDD to the input pin, and one from the input pin to GND). But... always remember there are linear and logarithmic pots, for a volume pot in your final amp stage you'll probably need a logarithmic one, while for values you digitally process linear ones are usually better. I am considering buying a midi controller, but it will be an additional one (for an additional future axo core) as I am really interested in building this one myself. Does the mW matter when choosing the pot? I know regular resistors are 1/4 or 1/2W, but there are pots in all ranges. I don't know what this would even mean when connecting to the Axoloti. Thanks! The pots I have used with no issues, if you are connecting to the analogue input on the Axo are 10K, anywhere between 0.05W to 0.5W, and they all work fine. I am sure some may prefer some to others, but it may also depend on what you are building, smaller pots likely will have a smaller rating. If you want to be very specific in your choice, get a variation and test them, they shouldn't cause damage to the Axo if connected properly.